Ellen Potter is the award-winning author of many books for children, including the Olivia Kidney series, Slob, The Kneebone Boy, and most recently, the Piper Green series. She lives in Maine. Visit her at ellenpotter.com. Felicita Sala is an Australian-born illustrator of many books for children, including Mr. Crum’s Potato Predicament, My Father Is a Polar Bear, and I Don’t Draw, I Color! Felicita lives in Rome. Visit her at felicitasala.com. "Sasquatch Hugo and human Boone deal with monsters, stereotypes, and cultural misunderstandings in the follow-up to Big Foot and Little Foot (2018). . . The sasquatch humor and heroes' earnestness make for a compelling story with natural flow, and the turnabout scenarios in which white Boone operates as a minority among the sasquatches are thoughtfully done. A lovely story of using empathy to work through culture clashes." "This satisfying sequel is as relatable as the first, touching on childhood obsessions, worries, and thrills. A fun romp with valuable lessons in friendship and forgiveness." 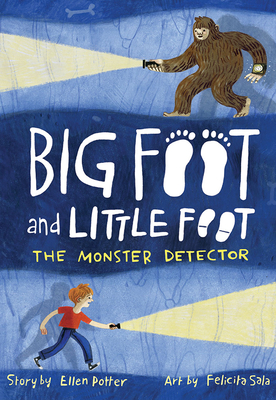 "Potter has once again penned a winner with this sequel to Big Foot and Little Foot. She includes just the right amount of adventure and excitement to keep children engaged and wanting to know what happens next. Her characters are believable and enchanting. The illustrations are simple but illuminating. VERDICT A successful installment in a delightful series about friendship and embracing differences in others."